On a positive note, I was overwhelmed with the raw power and breathtaking natural sights in Sagada. There’s nothing like waking up, literally, with your head in the clouds; lush pine forests with the striking blue sky above; interestingly suggestive rock formations in a cave; or gushing waterfalls that pour into shallow pools below. Most of the retailers, cafes and restaurants, as well as inns, are proudly local—owned by those who have a heart for Sagada and its environs. So city types should dispel notions of finding a McDonald’s or Starbucks anywhere there. Despite the grandeur of Sagada’s surroundings, a word of caution—the trip may not be for everybody. Sagada is for those with a genuine love for outdoor adventure and nature. There will be long winding, bumpy rides, dampness, strenuous hikes, and just basic inns or B&Bs. Bring a cap and a warm jacket, and leave your flipflops at home—this is rugged country and hiking boots or trekking shoes are more suited to the terrain. Also bring a face towel, lots of water and sunblock, especially on hikes! Just because it’s cool most of the time in Sagada doesn’t mean the sun’s rays are powerless. Sumaguing Cave. If you want proof that the earth was all under water once, this cave is it. Despite the altitude of Sagada, you can actually find seashells still stuck to the walls of the cave, frozen in time. 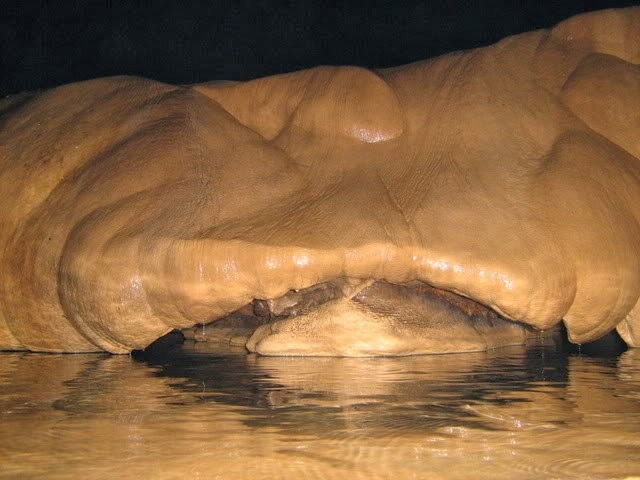 In fact, the rock formations do look sculpted by water as they undulate and curve like ocean waves. Close the visit by taking a dip in the cave’s bone-chilling waters…brrr! Definitely a wake-upper! It is invigorating and will kick up your energy as you make your way out of the cave and back to civilization. Echo Valley. The valley is where the famous Hanging Coffins­—probably the most iconic Sagada tourist attraction—are located. It is a pleasant short hike through more trees and vegetation (while amusing yourself by shouting to hear your voice echo). A few of the coffins hanging on a cliff look new, but there are older coffins stacked on top of each other at the Lumiang Burial Cave. 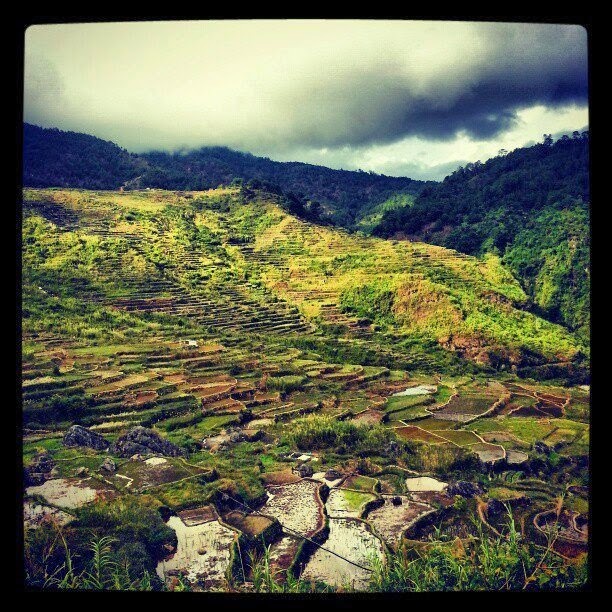 Rice Terraces. These are smaller than those found in Banaue, and the Igorot farmers here piled rocks instead of compacting soil to construct them. You can view this agricultural masterpiece by hiking to the Kiltepan Tower—about 45-minutes to an hour from the town proper (tiring yes, but you are gifted with breathtaking views)—or rent a van to take you there. Locals will encourage you to take off much earlier for Kiltepan so you can catch the sunrise. Bomod-ok Falls. The hike to these waterfalls is about two hours and takes you through the stunning rice terraces, giving you an up close and personal perspective of this geographical wonder. The water plunges 200 feet from the top of a cliff, splashing onto craggy rocks, and into a pool below where you can jump in for an invigorating swim. Yes, the waters are ice-cold but you’ll get used to the temperature eventually. The hike back will likely be more strenuous, and you will be sweating buckets for sure. 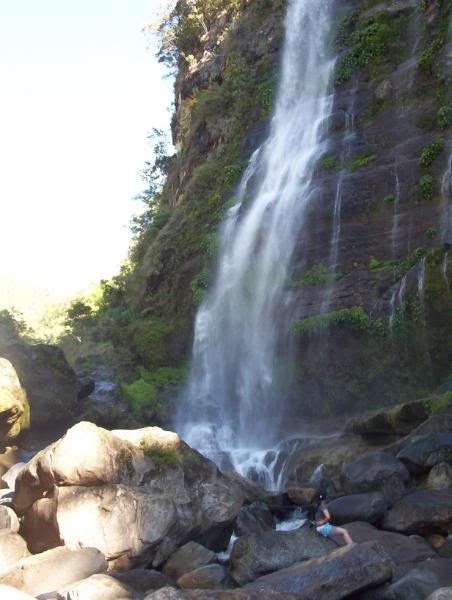 If long hikes are not for you, go to the Bokong or Small Falls instead. It’s some 20 minutes from the town proper, and while it is smaller with the water dropping from a height of just 20 feet, it has its charm as well. You can jump off from the top of the falls and plunge into the pool of water below. Even children can manage the short hike and you will definitely enjoy the swim. Eat up a storm. For those who want a local feel, try Pinikpikan Haus (Dao-angan, Sagada/0920-8135797) for its famous pinikpikan chicken, a dish traditionally prepared by lightly beating (pikpik) the live chicken first, before the bird is thrown into a pot of boiling water to remove the feathers, then its cut-up parts cooked into a broth flavored with etag (smoked dried pork­—another Igorot delicacy.) The restaurant also serves etag as a separate dish. Lemon Pie House (Atey, Daoangan/0907-7820360) is famous for, you guessed it! lemon pies. The tart citrusy custard is topped off by a light toasted meringue, giving it a slightly sweet undertone. It’s best eaten with strong brewed coffee or some mountain tea, which the café also serves. For salads, pastas and thick, creamy yogurt topped with fruits, try the Yoghurt House (Poblacion). Shop around. For unique woven bags, wallets, placemats, espadrilles, etc. go to the Sagada Weaving and Souvenir Shop (Nangonogan, Poblacion/0918-9276488), which is just about a 10-minute walk from the center of the town. The women still use wooden handlooms and create a wide array of colorful and artistic fabric designs. Intricately designed clay pots, urns, jars, mugs and the like can be purchased at the Sagada Pottery House. For a standard fee, you can also learn how to spin the wheel and sculpt a clay pot with your hands, from one of the artisans. Get some beans. Sagada produces some of the best coffee beans in the country. Aside from the highland Arabica, it also produces the rare and expensive Café Alamid made from the droppings of civet cats. Buy your beans at Bana’s Restaurant, a favorite breakfast nook of tourists; aside from the robust full-bodied coffee, it serves great omelets as well. Rock Inn and Café (http://www.rockfarmsagada.com) is some distance from the town proper but the perfect location away from the hordes of tourists. What’s more, it is located amid an orange orchard so you are allowed to pick and eat the fruits from the trees. Very clean and the staff are most courteous. The inn has massage services as well, an added bonus to soothe your tired sore muscles from doing all the hiking. If you want to wake up to grand views of the mountains and greenery, check into the Kanip-aw Pines Lodge (0928-2847507/0926-6092960). The rooms are basic with firm beds, a private kitchenette and balconies that look out to the mesmerizing mountain views. The owner, Oscar Magwilang, is also a tourist guide and can bring you around Sagada. Getting there: Yes you can drive all the way to Sagada; just make sure you have a powerful sedan or SUV, as well as handy relatives or friends to take over the wheel when fatigue sets in. I’d recommend staying overnight in Baguio to recover from the six-hour trip, before heading the next morning to Sagada (six hours away via Halsema Highway). Most who go to Sagada, though, commute. From Manila, take the Victory Liner (727-4534/833-5019 to 20), which has hourly bus trips to Baguio from its Caloocan, Pasay or Cubao terminals. Another option is Dagupan Bus (Cubao/929-6123); Dangwa Transit (Sampaloc, Manila/731–2879); Saulog Transit (Parañaque/825-2930); or Genesis Transport (Cubao or Pasay/T421-1427/551-0842). From Baguio to Sagada, take the GL-Lizardo Bus to Sagada at the Dangwa Terminal. Other routes are via Banaue and Bontoc, which also give tourists the chance to explore these scenic places (e.g., Banaue Rice Terraces) before heading on to Sagada. Via Benguet, take Autobus (Sampaloc/4934111) or Dangwa Transit. The bus arrives in Banaue after nine hours. From the same terminal, transfer to a jeepney bound for Sagada and which will travel for about four hours. If going via Bontoc, take Cabletours Bus (E. Rodriguez Avenue, Quezon City, inside the Trinity University campus/63918-5216790)—the trip will take 12 hours. From Bontoc, there are jeeps that go to Sagada; the ride will take an hour. (For more on Sagada, check out http://www.visitsagada.com. Local tourist guides are available via the Sagada Genuine Guides Association at 0929-5569553 or the Sagada Environmental Guide Association at 0999-3915660 or 0919-7856140).